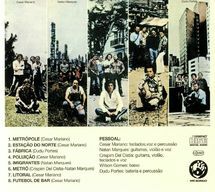 One of the finest Brazilian jazz funk fusion albums ever recorded; thoroughly deserving of its cult status. First official reissue outside of Brazil. Cesar Camargo Mariano is a celebrated Brazilian jazz pianist, composer and producer, born in Sao Paulo in the 1940’s. He has played and worked with the likes of Elis Regina (to whom he was married at one point), Som Tres and Sambalanco Trio and still plays very regularly today. ‘Sao Paulo Brasil’ saw Mariano and co. step deep into jazz funk/fusion territory – and nail it. Tight, tough drum grooves, intricate arrangements, layers of synthesisers, percussion and FX transport and tell a story from the first beat. Wykonawca Cesar Mariano & CIA.